The Autism Services, Education, Resources & Training Collaborative (ASERT) is pleased to announce the release of the Pennsylvania Autism Census Update. The original Pennsylvania Autism Census released in 2009 identified almost 20,000 individuals with autism receiving services across the Commonwealth of Pennsylvania. 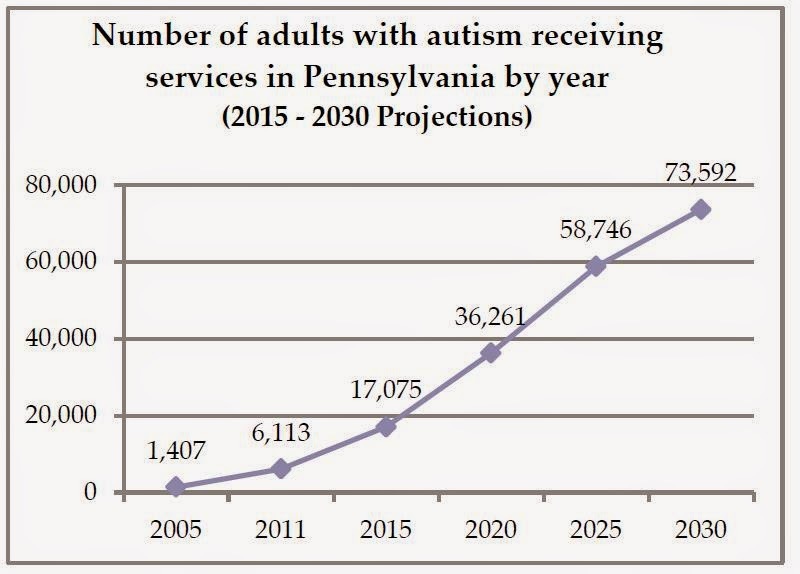 The 2014 Pennsylvania Autism Census Update now estimates that there are over 55,000 children and adults with autism receiving services, which is almost triple the number initially identified. The study found that the number of individuals with autism receiving services in all age groups has increased tremendously since the original census study was released. It also found that adults with autism receiving services were the fastest growing group in Pennsylvania. This dramatic upward trend is expected to continue. Learn more about the Pennsylvania Autism Census at www.paautism.org/census . This website includes a clickable map showing information for each county in Pennsylvania. Resources are also available through the ASERT Collaborative at www.paautism.org or by calling the Statewide Resource Center toll-free number for live assistance at 1-877-231-4244.